Understanding of the anatomical relationships of the vertical talus deformity, from either congenital or iatrogenic etiology, is critical in assessing treatment options whether conservative or surgical. 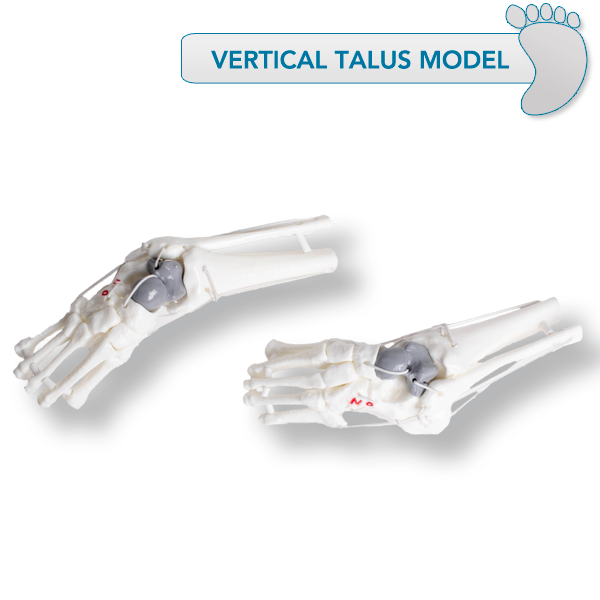 The MD Orthopaedics Vertical Talus Model was designed to give the proper anatomic orientation and relational disposition of the typically rigid, irreducible talonavicular dislocation that defines the deformity. The model is representative of a child six months of age. The model includes a gray colored talus bone for instructional orientation and the "NO" directive, by Dr. Ponseti himself, over the calcaneo-cuboid joint. The Vertical Talus Model can be purchased as a set or can be purchased individually in the left or right.